A delicious mix of baking and making. Today I am joining in with the Bugs & Fishes Christmas Tutorial Link-up where lots of talented crafters are sharing their festive tutorials. Pop over to take a peek - Xmas inspiration a-plenty! 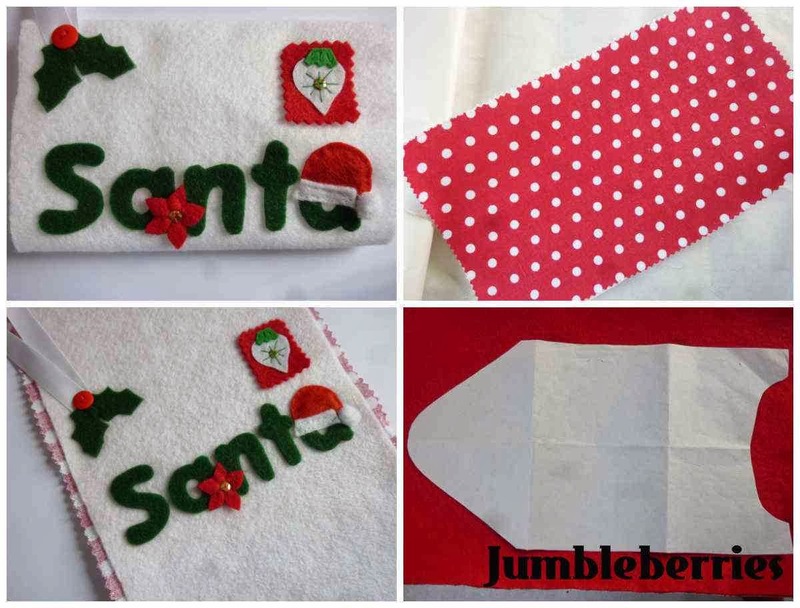 Fill it with your letter to Santa and then hang it on the foot of your bed. To start, fold your A4 sheet of paper into 3 equal parts. Measure a strip approx 5cms wide along the long edge of the paper, cut off and discard. 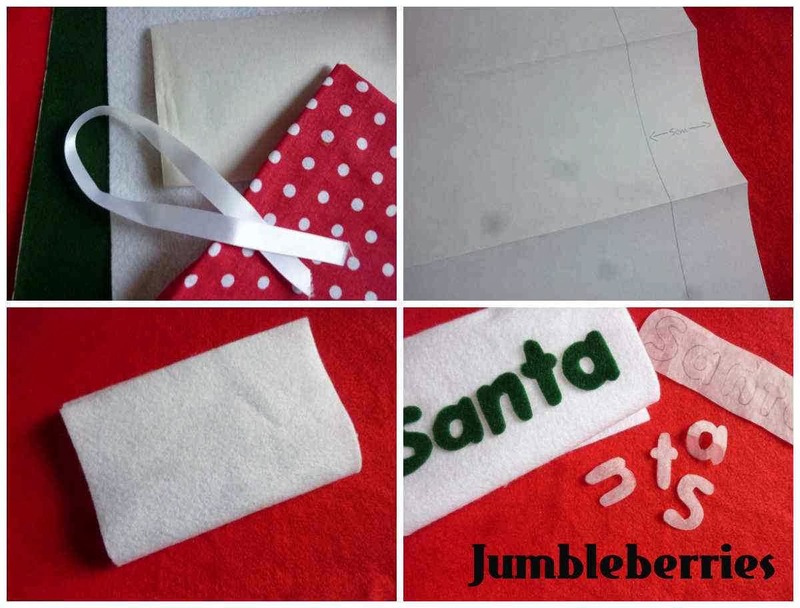 Using the paper pattern, cut your sheet of white felt down to size. Fold the felt into 3 sections, as you did with the paper pattern - the middle section is where you are going to add your embellishments. 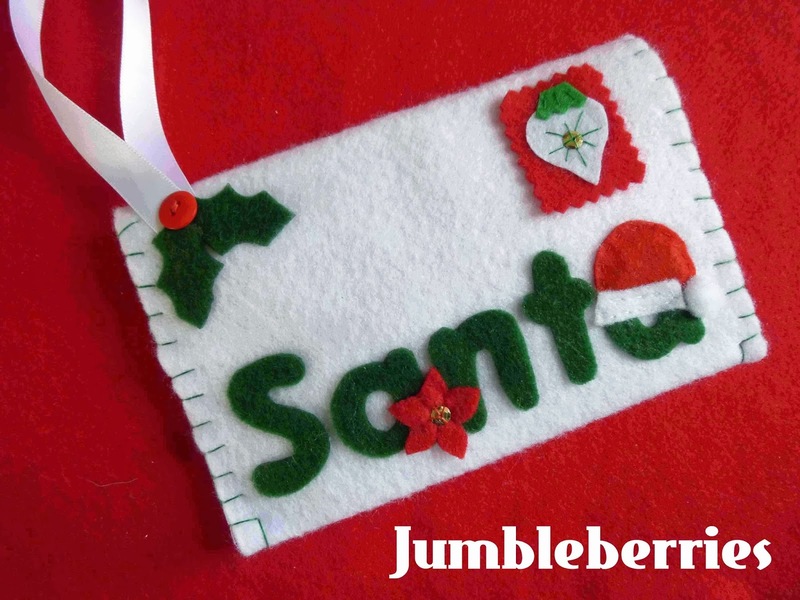 From the sheet of green felt, cut some lettering to spell out the word 'Santa'. 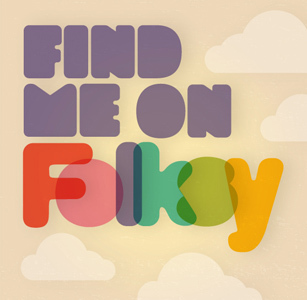 Add your lettering to the middle section of the white felt, positioning the word in the lower half of the space. I used sticky-backed green felt for my lettering, purely because I had some. If I had used normal felt, I would have blanket-stitched the lettering using white embroidery thread. 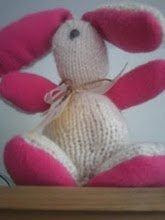 Next sew your motifs into place. 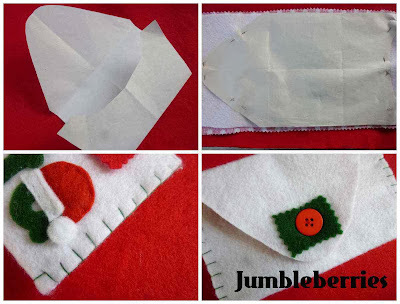 Sew the stamp shape in the top right hand corner of your envelope. You can decorated the middle of the bauble shape with a gold sequin to add some extra sparkle. Position the Santa hat above the last 'a', adding a mini pom-pom on the end. 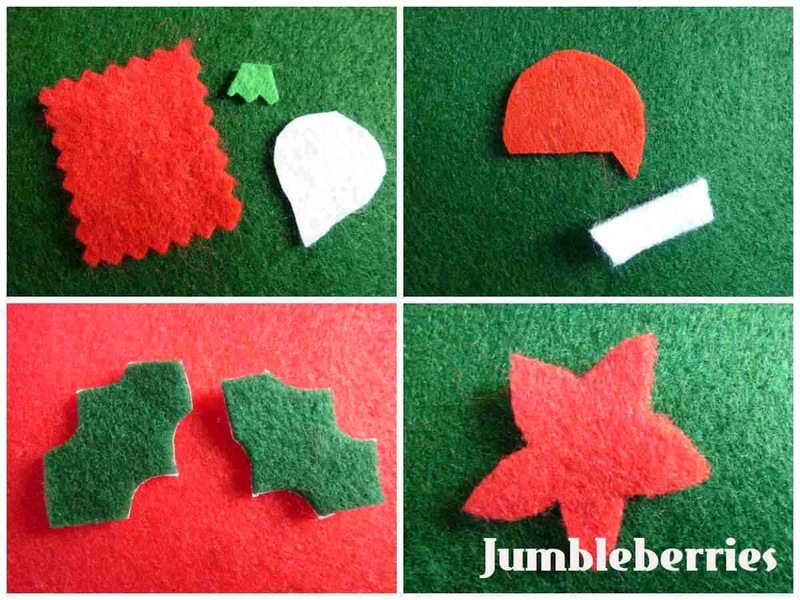 Create a poinsettia motif, using a 5 petal flower shape, gathering it slightly as you stitch it into place. Highlight the middle with a gold sequin. Finally sew a loop of ribbon onto the top left corner of the envelope, securing it in place with the two holly leaves and a red button berry. 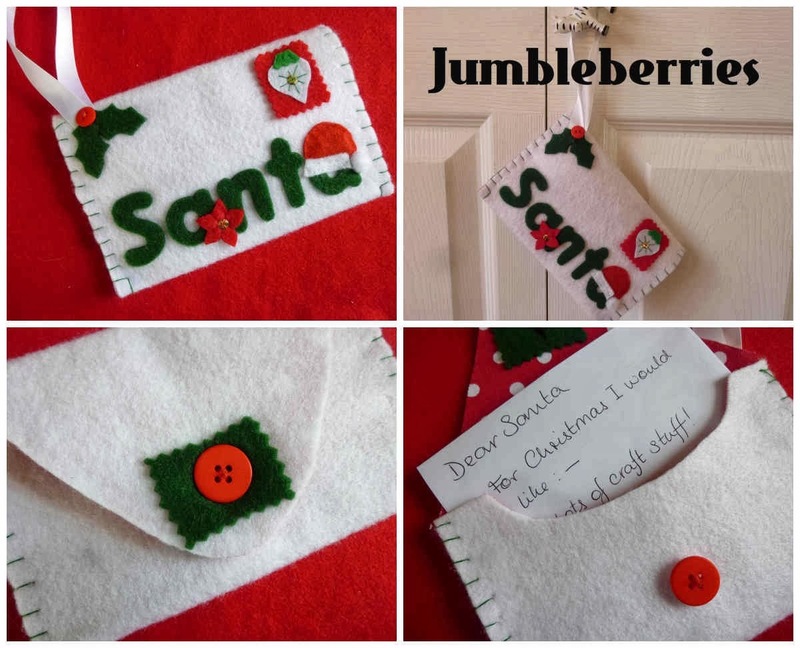 Once all of the embellishments have been stitched into place and the front of your envelope is complete, you can now line the envelope. 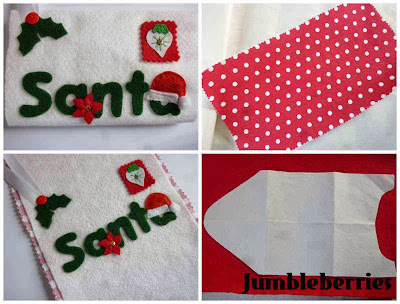 Cut your piece of material to size, making sure that it is slightly larger than your envelope shape. Iron your piece of bonda-web to the back of your material. Peeling away the backing paper, iron your piece of material to the back of your envelope. Make sure you iron the material and not the felt or you will melt your envelope! Using your original paper pattern, cut the top of the template into a curved point. Add a shallow cut-away shape to the bottom of the template. Pin the paper pattern onto your envelope and trim your felt and material to shape. Sew a button to the middle of the back section and cut a small slit in to the envelope 'flap' for a button-hole. 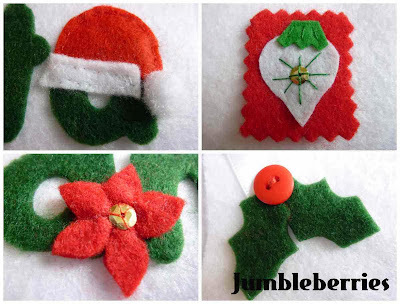 You can strengthened the button hole by sewing on a square of green felt, cut with pinking-shears. And there you have it. All you need to do now is write your Christmas Wish-list, hang your envelope up along-side your stocking on Christmas Eve and sit back and wait for Santa. Please do let me know if you make your own Christmas Wish-list Envelope - I would love to see your version. (Please note that this tutorial is for personal use only). 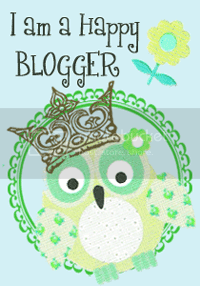 Cute tutorial... thank you for sharing!